Serving Bryan-College Station, Texas in the Antiques Field since 1974! Auctions are scheduled for client’s needs and can be hosted on site or in our climate controlled auction house. We have been in the antiques business in Bryan-College Station, Texas since 1974 . 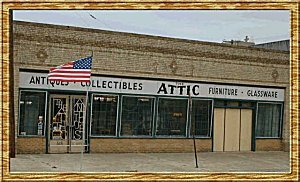 The Auction House site is open only for actual auctions, whereas we can always be reached at our daily business,The Attic Antiques, 118 S Bryan Street, Bryan, Texas where we offer antiques and collectibles in our 10,000 square feet building to include restored items and unrestored items. We are always happy to help with telephone and E-Mail inquiries. Give us a call today!